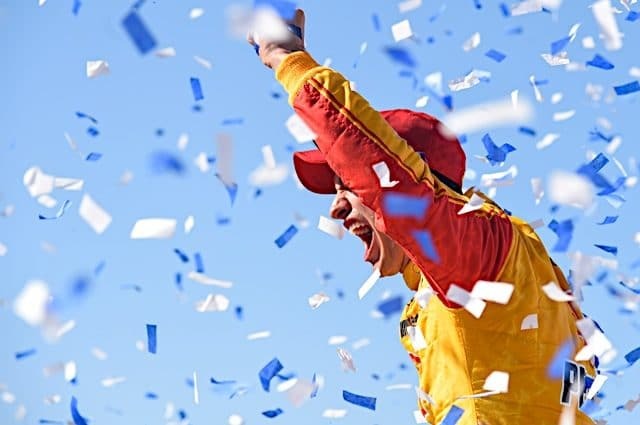 It’s perhaps poetic that Joey Logano won his first Cup title in 2018, as his Ford 400 win came on the same Sunday that Matt Kenseth’s career came to a close. After all, had it not been for a run-in with Kenseth at Martinsville in the fall of 2015, Logano may well have had a Cup title on his resume prior to this season. Anyone that’s watched NASCAR even passively over the past few years remembers what happened at Martinsville in 2015. Matt Kenseth, livid over contact with Logano several weeks prior, and leading the charge of a field that was being kept at bay by Penske teammates Logano and Brad Keselowski tag-teaming the restart lanes, wrecked the No. 22 in one of the most brazen dumps big league stock car racing has seen since Earnhardt/Labonte ’96. Logano saw a season that started with a Daytona 500 trophy go up in smoke that Sunday. Fast forward to 2018, and it’s apparent just how much NASCAR’s youngest veteran has learned. This fall, heading back to the same Martinsville paper clip that axed his 2015 title aspirations, Logano threw this year’s Cup title race into a similar tailspin. In a season that saw Stewart-Haas Racing steal Penske’s mantle as the top dog in the Ford brigade, and that saw Kyle Busch, Kevin Harvick and Martin Truex Jr. beat the entire Sprint Cup field into seeming submission, Logano used a chrome horn of his own to score a critical win at Martinsville, punting the defending Cup champion Truex in the process. It was a move that demonstrated both understanding and mastery of Cup racing in the playoff era; Martinsville was Penske Racing’s best remaining track, and Logano did literally what was necessary to win that race. For all the hubhub that the move generated (and an angry Truex proclaiming “he [Logano] won’t win the damn war”), Logano calculated (correctly) that with no short tracks left on the schedule, the chances of revenge being exacted on a 1.5-mile oval such as Homestead were slim. After all, with 11 laps left in the season, it was Truex that Logano passed to drive off into the sunset with NASCAR’s Cup trophy. Subtract the playoff structure that Logano capitalized on, and 2018 was still just what the doctor ordered for the driver who can now make a strong case for being the No. 1 in the Penske stable come Daytona in February. After a 2017 season that saw the No. 22 team miss the playoffs after finishing outside the top 20 nine times during the summer and lose their only race win due to a rear suspension irregularity at Richmond, Logano scored eight top 10s in the first nine races of 2018 before breaking through with a win at Talladega. After a quiet summer stretch (though Logano would only finish outside the top 20 four times during this run in 2018), the consistency that got Logano on track in the spring came roaring back in the playoffs. Delivering the team’s best intermediate oval finish in nearly five months in the playoff opener at Las Vegas, Logano was good enough at Richmond and the Roval to maintain his sixth place in the standings, leading him to the Penske stronghold of the schedule. Third at Dover, a track where his teammate Keselowski had led over 100 laps in the spring. Fifth at Talladega, tops among playoff drivers not racing for Stewart-Haas. A top 10 and a pole at Kansas, the same track where Logano scored his best intermediate finish of the year (until Homestead). And oh, that win in Martinsville. Scoring three wins, 26 top 10s and leading more than 900 laps over the course of the year, Logano’s numbers were not career-bests, but they were more than enough to demonstrate that 2017’s doldrums were a blip on the radar, not a career on the decline. Now, heading into 2019, Logano is top dog at Penske, and driving for a race team that won as many playoff races as 2018’s “big 3” organizations did combined. Even without a Cup title, it’s safe to say Logano and the No. 22 team would have taken those results had they been offered at Speedweeks. At age 28, Logano has been Cup Rookie of the Year, an All-Star Race winner, a Daytona 500 champion, and now has won his first Cup title at a younger age than Dale Earnhardt or Jimmie Johnson. The greatest thing since “Sliced Bread”? Maybe, maybe not. But 10 more years with those results behind the wheel, and Mr. Logano will have another title to add to his resume: Hall of Famer. Next 2018 NASCAR Top Storylines: How Did Each of the Big 3 Fall Apart?